Via prisoners’ rights group al-Hurriya lil Gadaan. Thanks to Ahdaf Soueif for the translation. 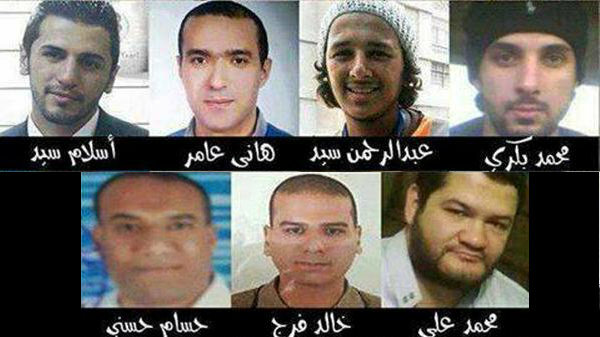 On 21 October 2014, in case 43/2014 Military Crimes North, known as the “Arab Sharkas” case, a military court sentenced 7 citizens to death and 2 to life imprisonment. On 24 March 2015 the appeal against the judgement was refused. The sentences are thus ratified – after an extraordinary trial that lacked the most basic elements of justice. The conditions of complete and absolute justice are impossible to guarantee even under the best conditions, even in times of stability when the institutions of the state and its legal systems are working efficiently and transparently – how then in times like ours and with extraordinary procedures like military trials for civilians? Anger and polarisation dominate the public sphere in Egypt today and violence has spread into the details of daily life. This leads many to celebrate executions – particularly if they happen to coincide with completely separate major crimes receiving wide and organised media attention. It leads many to approve death sentences without paying close attention to the details of the trials or being certain that they have reached a just conclusion. The situation becomes more critical when we consider that there are hundreds of citizens who have received death sentences and are now in line for execution. We, as a society, are about to implicate ourselves in a very heavy burden of responsibility. Military prosecutors accused the nine men of planning and participating in an attack on an army personnel carrier in Amireyyah, Cairo, in which a military aide was killed on 13 March 2014; of killing 6 conscripts 2 days later at a military police checkpoint at Musturud, South Cairo; then of killing an armed forces brigadier-general and a colonel in a gunfight on March 19, in Arab Sharkas, a village north of Cairo, when an army unit raided a disused storage warehouse in an attempt to capture them. But at least 2 of the men now facing execution could not have participated in any of these actions because authorities had detained them months earlier and were still holding them at the time. Both men have stated that they were held and tortured in the secret military Azouli Prison in Ismailia until they were sent for questioning to Aqrab Prison and that they have submitted reports which the Prosecution did not investigate. Hani Amer (32) is a science graduate and has worked in programming since 2011. He is married with 2 children. He has stated that he was detained in the Third District, Ismailia, on 16 December 2013. His mother sent telegrams on 17 December 2013 to the Minister of the Interior, the Chief of Police in Ismailia and the Attorney General. Certified copies of these telegrams are in the case file. His mother also lodged a formal complaint with the Public Prosecutor (Public Prosecutor Complaints No 2901/2014) on 5 February 2014, detailing the circumstances of his detention and his imprisonment in Azouli Prison. His family were only allowed to visit him 2 times, once in August 2014, the other in February 2015, each time for just a few minutes. At his first hearing in the military court Amer said to the presiding judge “I never saw a prosecutor, I was in Azouli from December and I was brought straight from Azouli to Aqrab on 20 March.” He received no response from the judge. Muhammad Haroun (31) is a commerce graduate. He has stated that he was detained, with his wife, on 28 November 2013 in Zagazig, Sharqiyyah. His wife was held for 10 days in the local National Security facility then set free. His family and lawyers lodged a formal complaint with the Public Prosecutor (Public Prosecutor Complaints No 1739/2014) on 1 February 2014. His family were only allowed to visit him once: in February 2015. Abd el-Rahman Rizk (19) is a high school student and is the youngest of the prisoners sentenced to death. We call to mind that we have documented cases of prisoners who confessed under torture to murders that they were later proved innocent of. Eg. The case of the actor, Habiba and the case of “The Killer of Bani Mazar”. We even have a case where it was later proved that the crime had never been commited: the case of Muhammad Badr el-Din. We, the signatories below, though we hold varied positions regarding the death penalty, are united by one just and urgent demand: Suspend the execution of death sentences in the case of “Arab Sharkas” and all other cases until we are content that torture is no longer part of our lives and that we are subject to an efficient and self-respecting system of justice that is not affected by political battles. An execution cannot be undone. There is no loss greater than that of a life. Suspend the Executions.